This magnificent Fountaine Lavezzi Maestro 3 cabin owners version has so much room and is presented like new. 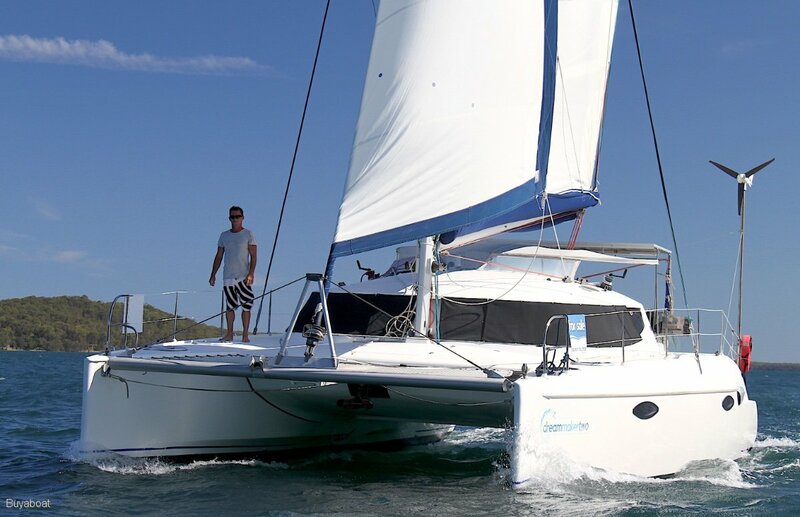 'Dreammaker Two' Is an incredibly comfortable catamaran with spacious saloon, large galley up with heaps of great features. On the starboard side the owners area is more than comfortable with a large aft cabin and lounge area. Plenty of cupboard and hanging spaces and the bathroom is roomy and modern with separate shower. On the port side you will find two large double cabins with heaps of space for getting changed. Port side has it's own head and shower. The cockpit is a very clever design with heaps of entertaining space and the helm love seat is a must. They have an excellent stainless storage area designed into the targa so hold all the gear you will need. This boat is a true bluewater boat and has the capacity to take you anywhere in the world and is easy to sail. Don't miss out on this great cat, she is ready to go and waiting for a new adventure. Mini keels (keels are sacrificial so if you do hit a reef the boat remains dry) now thats safety! Volvo Penta 30 Hp Sail drives, fresh water cooled, in excellent condition. 1800 rpm 2L an hour, 2100 rpm 3L an hour. 250 L stainless steel tanks, 180 L Jerry cans. Galley up position keeps you where you want to be, with EMD gas stove, with 3 burners and oven, heaps of cupboard space, twin stainless steel sinks, with special drainer sink, cutting board inlays, stainless plate rack. Galley table seats 7, hot and cold water. Spectra water Maker 6.5 L an hour. Starboard owners double cabin, Port forward double, port aft double, Saloon folds down to double, Day bed rear cockpit. 3, Full stand up, separate on starboard side. Port side large shower part of head, one in cockpit. 2 Electric macerator with hand basin and cupboard space, both with 30 L holding tanks. Vision 24 " TV with DVD, Alpine FM radio and CD. Inflatable, solid fibreglass floor, holds 4 in good condition. Cockpit shade, full clears, window shades, curtains, boom cover. Electric Maxwell anchor winch, with plough anchor, plus a spare Bruce anchor, 80 mt chain, fenders and lines. 6 Life jackets, EPIRB, V sheet, life ring, fire extinguishers 4,1st Aid kit, torch, flares, fire blanket, Life raft 6 person. 6 house batteries, 2 start, 5 X 80 w solar panels, wind generator for night sailing, hand held spot light, shore power rigged, LED lighting. AIS receiver and transmitter, Raymarine Auto Pilot, Chart plotter, sounder, RADAR, COBRA VHF radio. 2015 rigging replaced, lazy jacks. 4 self tailoring winches, dingy davits, large storage area on targa, Stainless steel BBQ, Cockpit cushions, boat mooring hook, boat swim ladder.